Medical labs, with specialties like clinical testing, blood bank, anatomical pathology or microbiology, must meet around-the-clock and highly time-sensitive quality demands. As hospital-based clinical laboratories struggle to keep up with new diagnostic technologies, genetics pathology, and increased automation, high-performing flooring systems can greatly support the efforts involved in maintaining a contaminant-free environment. 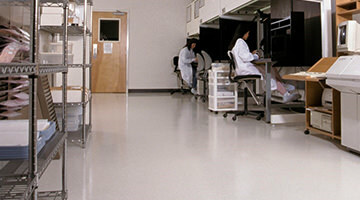 From bacteriostatic properties to chemical resistance and static dissipation, laboratory floor coatings can make a difference. The diagnostic lab is a highly sensitive space for any hospital. Laboratories must stand up to harsh chemicals and biocides without compromising hygiene and health standards. Florock offers custom epoxy floor coating systems to help you achieve the cleanroom-like environment that patients and staff depend on. Our array of floor coatings are designed and tested to meet the demands of any research or medical facility or laboratory environment. To help you create the perfect bacteriostatic lab environment, we also offer custom concrete epoxy paint options for maximum performance. All of our flooring systems are seamless, eliminating the risk of bacterial growth and collection of dirt in crevices and cracks. They are also exceptionally easy to clean and decontaminate. 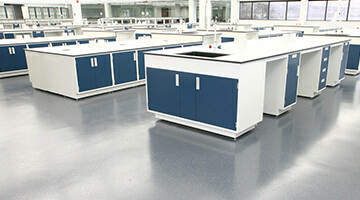 Our durable flooring systems for laboratories furnish lasting beauty, ongoing safety and are among the lowest lifecycle cost options on the market. Overall, they offer outstanding flooring value. Get in touch with a flooring specialist to discuss the best hospital diagnostic or clinical laboratory flooring solution for your application. Florock Electrostatic Dissipative (ESD) Flooring – For labs with sensitive equipment, our ESD flooring safeguards expensive electronic equipment and personnel.